Being a United Way Winnipeg Agency Partner, we have access to wonderful events such as United Way Day of Caring. This is a wonderful program in which local groups can arrange through United Way Winnipeg to volunteer at an agency partner just like Main Street Project. 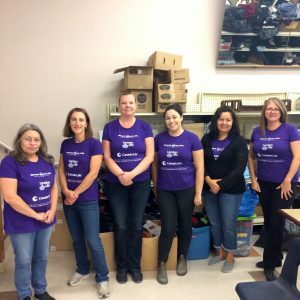 This week we were fortunate enough to host an amazing group of volunteers from Great-West Life, who generously gave their time to help organize our clothing room. Thanks so much! We really appreciate it a lot!